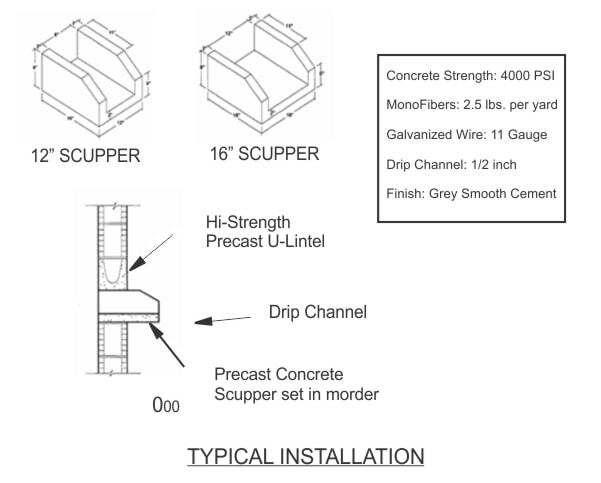 Decorative and functional in North Lauderdale, Precast Concrete Scuppers are designed to allow rainwater to exit through outlets on your built-up of flat roof. In parapet walls, gravel stops, and other structures, these blocks can ensure drainage without leaves and debris becoming trapped. Our team can cast custom scuppers from your unique samples or specifications when you call Atlantic Coast Precast today to get started with a FREE quote. Invest in a smart rainwater management solution with precast concrete. Did you know that precast concrete is watertight, reliable, maintenance-free, and actually strengthens with time? Not only that, but in North Lauderdale, precast concrete scuppers can be customized to match the unique style you have in mind. Atlantic Coast Precast works with designers, contractors, engineers, and architects among many other industry professionals to make strong scuppers. Our team will be sure to install your North Lauderdale precast concrete scuppers flawlessly, with the proper positioning and placement. Installing scuppers incorrectly could result in rotting wood on your deck or roof, mold in your walls, or severe structural damage. Since 1965, Atlantic Coast Precast has produced scuppers and downspout splash guards alike for residential, commercial, and industrial properties alike. Call today to get started.